Last week I was exploring the Canadian Muskoka wilderness with my parents. After nine really tough weeks it was time for a vacation. It was my first family vacation ever! 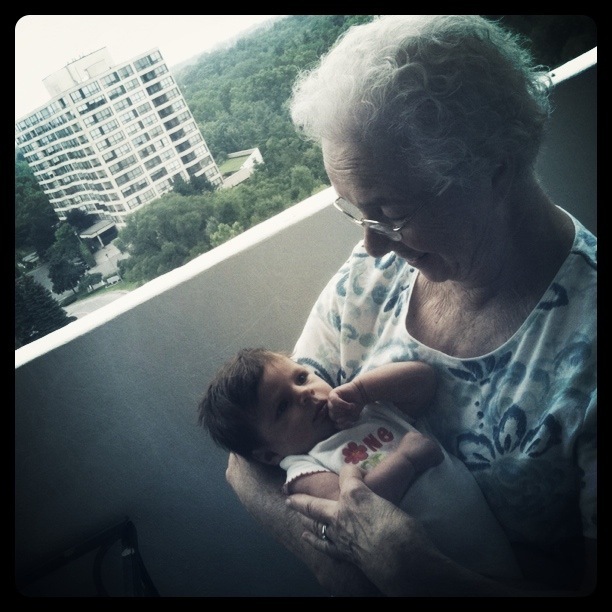 First we drove to visit my great-grandparents in St. Catharines, they are really cool. They can’t get enough of me. My parents are nice enough to chauffeur me to their house to be spoiled every once in a while. After lots of hugs and kisses we began the long drive to Huntsville in Northern Ontario. I was kind enough to sleep most of the way there. Mommy rode beside me to see to it that my soother stayed in my mouth…it worked. I even said my first word…mum! Daddy, doesn’t agree, but mommy is convinced! 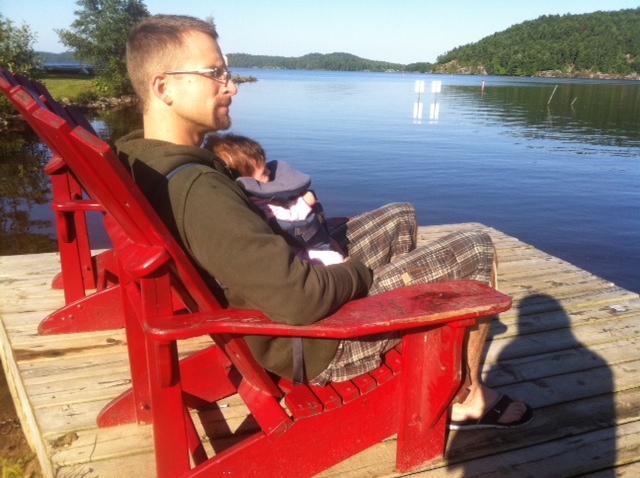 Lounging with Daddy by the Lake! around the campground. We saw some deer, lots of great views and a lot of old people riding around in golf carts. I keep asking mom and dad to get me a new ride… something a little faster than my carrier, but I don’t think they understand what I’m saying. They usually just stick the soother back in my mouth. We have took several trips to a place called Dairy Queen where mommy and daddy debate over which flavour of blizzard they should have. Mommy always wins…chocolate chip cookie dough, the best!!! Daddy and mommy have did a lot of reading. The strange thing is that daddy didn’t use his electronic devices. I don’t think I saw him touch his phone the entire vacation…except to take pictures of me of course! The best thing about vacation is that I get to fall asleep in daddy’s arms several times a day. This hardly happens at home because he is so busy with work. Daddy is not quite as good as mommy at getting me to settle down, he doesn’t have the same amount of practice. Mommy enjoyed a break from being the only person to experience my head sweating all over her arms when I am falling asleep. 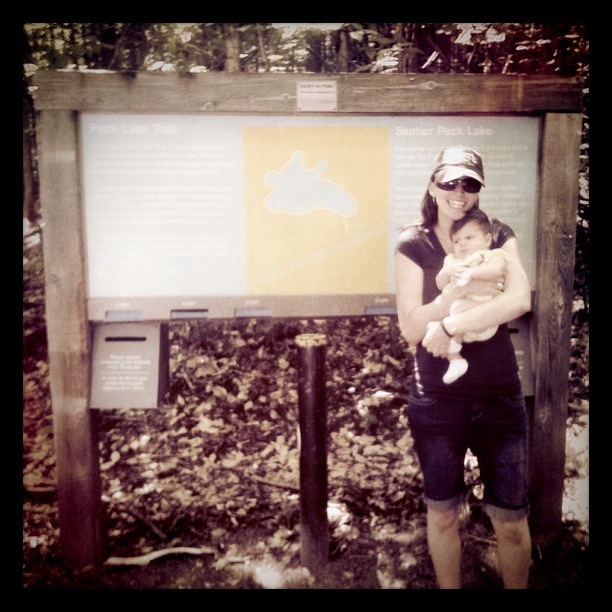 One day we drove to Algonquin park and went on several beautiful hikes. We hiked all the way around Peck Lake on one hike. Well, mommy and daddy hiked and I was carried on daddy’s chest in the carrier. The view was nice… until I fell asleep for the second half of the hike. Some day daddy will take me on a long canoe trip into the interior wilderness of the park. That will be really fun. I really enjoyed it in Muskoka. I hope I can come back some day soon. I am feeling rested and rejuvenated and ready to face the busy world of being a two month old in Rochester, New York. Bye for now.